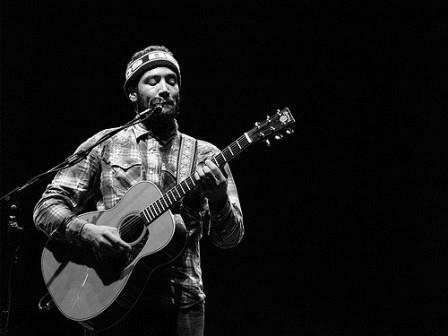 This week’s acoustic guitar spotlight is on Ben Harper. This short Ben Harper bio will take a look at some of the story behind the guitarist and his music. Whilst Harper is not solely an acoustic guitarist he does use an acoustic guitar in a lot of his songs – some of which are, in my opinion his best works. Harper was born in California in 1969. He was raised in a musical family – his parents and grandparents all involved with music in one way or another themselves. Harper started playing guitar early in life and played his first gig at age 12. In his early twenties Harper toured with Taj Mahal (an American blues musician) and helped him to record the album Follow the Drinking Gourd in 1990. Harper is a big supporter of the not-for-profit organization Little Kids Rock which helps underprivileged kids with music education in US public schools. He has performed in many concerts and supported many causes to increase social awareness around a number of issues. Harper has developed a fusion style of music that takes from varying genres and a lot of his songs have a socially conscious message – much in the way that Bob Marley did. This is not surprising, given that Harper counts Marley as one of his biggest influences. Seeing Marley play in 1978 at just age 9, apparently had a lasting effect on the singer, songwriter. Harper has never found himself genre bound. Across his 13 studio albums he has created music from several genres -blues, reggae, funk, rock, gospel, soul, pop, and folk – often mixing them together. His first studio album was released in 1994 – Welcome to the Cruel World – a number of songs highlighted his socially driven views – such as Like a King and Still I Rise. Fight for Your Mind came next and was released in 1995. It was certified gold (meaning sales of 500,000 copies) and put Harper on the map. Songs like Burn One Down having a particularly Marley-Esque sound to it. Ground on Down showcased Harper’s skill at playing the slide guitar. Harper honed the art of the Weissenborn (lap style slide guitar) earlier in life and slide guitar has become one of his signatures. The Will to Live, his third album, was released in 1997 and he rounded out the 90’s with Burn to Shine, released in 1999. Harper’s band, The Innocent Criminals, has been credited on some albums and not on others – though he has been playing with them in some shape or form since 1997. His first album released in the new millennium was Diamond on the Inside. Some critics thought of this album as being too commercial and not the same rugged down to earth sound heard on earlier albums – particularly Welcome to the Cruel World, Fight for Your Mind and Will to Live. Others, however, lauded this as his best work to date. Following Diamonds on the Inside, in 2004, Harper released There Will Be a Light with the Blind Boys of Alabama – which was a distinctly gospel sounding record and actually won the award for Best Gospel Album at the Grammy’s and the song “11th Commandment” also won a grammy. He also recorded the record As I Call You Down as part of the “supergroup” Fistful of Mercy, released in 2010. In addition to all of this he has also released a number of live albums – including the renowned Live from Mars released in 2001. Harper is known for his live performances and he is definitely worth seeing live. I’ve had the pleasure of seeing him live in concert twice and his musicianship and performance is quality and inspiring. Particularly for those who play guitar, he is great to watch and it is sometimes difficult to comprehend how he plays some of what he is doing, whilst singing over the top of it. If there’s anything else you want to add about this undeniably talented and eclectic guitarist just leave a comment below. I’d love to hear what opinions people have of his music particularly his latter work which I’m not that familiar with.